You need to first check your records against state law to see if you’ve been clear of any offenses for usually 5 to 10 years. Then, call a DUI lawyer so they can start the expungement process. If you have a DUI conviction, there is hope of getting a drunk driving conviction removed from your record. The key to success is hiring a drunk driving lawyer, who knows how to get drunk driving convictions expunged. 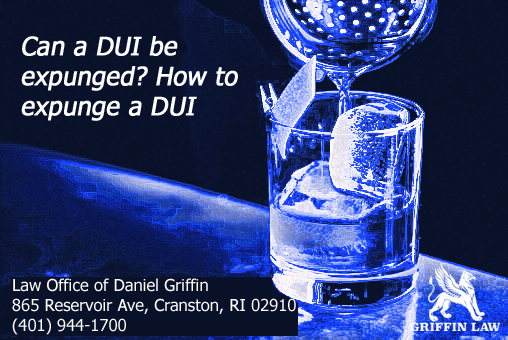 When you choose Daniel Griffin you’ll be matched with an RI DUI attorney who has a high level of experience and success. This legal eagle will use every legal tactic available in order to help you get your criminal record expunged, so as to minimize the downside of having a DUI conviction. Your drunk driving attorney will take a look at your case and all of the variables at play. During a consultation, your RI DUI lawyer will go over your case, ask you relevant questions and take a look at the evidence. After doing a careful review of your case, you’ll how good of a chance you have getting your DUI conviction expunged. Then, you’ll be able to decide whether or not to retain the lawyer as counsel. What is An Expunged DUI Conviction? A DUI conviction tends to cause a lot of problems down the line. It may make it more difficult to rent a home or apartment. It may also put you out of the running for a lot of jobs and drive up the cost of your car insurance premiums. It may also bring a sense of social shame. There is a way to get this type of criminal record expunged. While every case is different, it’s safe to say that many of those who have been convicted of drunk driving and gotten the right legal representation have managed to get their records expunged. Some states don’t allow these records to be expunged. Others do permit it. If it is permitted, a person who wants a DUI conviction expunged will need to meet specific eligibility requirements. A drunk driving attorney will be able to look at your case and then let you know if you meet the criteria. Expungement is the process of having a DUI conviction erased from a public record. This service is ordered via a judge, after a person with a DUI conviction files a petition via the courts to request an expungement. If the record is expunged, it’s just like the conviction never occurred! Time frames for pushing through an expungement will vary widely. Only a skilled lawyer who is licensed to practice law in your state will be able to advise you about a realistic time frame for your particular case. This type of attorney will understand every facet of drunk driving law in your state. In general, this process takes a year or more to complete, but it does vary a lot. While it is possible to get a criminal record expunged, your DUI will still remain on your driving record. Will the DUI actually be expunged? In terms of what a judge will look at before making a decision about whether or not to expunge your record, he or she will see if you have other criminal convictions which took place after the DUI conviction. As well, he or she will look at your post-DUI driving record. If it’s been clean since the DUI, that will work in your favor. If it isn’t clean after the DUI, it will hurt your chances. A great drunk driving attorney is the best person to hire when you want to have your criminal record for a DUI expunged. You will need legal expertise in order to boost your chances of success. The services that we offer will help to strengthen your position in front of a judge. As well, you’ll access accurate information about expungement and the odds of expungement. Also, you’ll receive expert advice which helps you to understand your rights. If you want your record expunged, we are the best people to talk to. This is why we encourage you to contact our legal office today. Also, if you’ve just been charged with a DUI and want to try and avoid being convicted, you should contact us as soon as possible. What you do right after you have been charged will be very important. It’s safe to say that getting a good lawyer should be priority one under this circumstance. We are standing by to help you build the strongest defense possible! When you hire drunk driving lawyer Daniel Griffin, you’ll be investing in your own future. Without expungement, you may find that negative consequences which are related to your drunk driving conviction plague you over the long term. Once your record is expunged, you won’t have to tell prospective employers about your conviction. You’ll be able to compete with other applicants on a level playing field. As well, you’ll enjoy greater peace of mind, as you’ll know that this black mark in your personal history has been erased from public records. Getting in touch is easy. Just call or email in order to talk to Attorney Daniel Griffin. Contact us today for a free consultation and you’ll get expert advice from a drunk driving lawyer with tons of experience. The Law Office of Daniel Griffin specializes in handling drunk driving cases. When you do, you could avoid the significant disadvantages that come with having a DUI conviction on your criminal record.